Burke, Texas is a small town in southwest Angelina County on U. S. Highway 59 between Lufkin and Diboll, situated on what was originally called Bradley Prairie. Once briefly the largest and most important commercial center in southwest Angelina County, Burke has been superseded by the later-founded cities of Lufkin and Diboll and is now primarily a residential community with little commercial activity. The boundaries of the place called "Burke" are imprecise. Burke is an incorporated city, but that came fairly late in its existence. The city covers mainly the heavily populated area in and near the town center. Before incorporation Burke was defined by the old Burke Independent School District, which stretches from near Hoshall on the north, to the intersection of U. S. Highway 59 and FM 2497 on the south, to Ryan Chapel Methodist Church and FM 2497 on the West, and to Fairview on the east. . Anyone who attended Burke school considered himself a resident of Burke whether he lived in town or not. The City of Burke is located in the center of the Burke region about 4 miles north of Diboll and 8 miles south of Lufkin on U. S. Highway 59. It lies about 8 miles north of the Neches River. The layout of the town of Burke was shaped by the railroad, which runs essentially north and south through the town. The original businesses were generally adjacent the railroad or west on a road that led to Burke School. The two story brick Burke and McCall store that survived into the 1970's faced the railroad track and served as the focal point of the town. The most prominent people in town lived in houses built along the west side of the railroad tracks, except for the McCall home on the east side adjacent old Texas Highway 35. The main roads for automobiles essentially paralleled the railroad. The original dirt surfaced Houston Road passed north and south on the east side of the railroad. It deviated to the east north or Burke via the "road with a tree in the middle" but eventually rejoined the railroad at Hoshall. The first paved highway, Old Texas 35, known locally as the "Old Houston Highway," followed the Old Houston Road except that it paralleled the railroad all the way to Hoshall. The current U. S. HIghway 59 lies a quarter mile southeast of and parallel to Old 35. A proposed new Interstate Highway 69 will bypass entirely Burke several miles to the east if it is ever built. When Burke was founded, it supplanted the Pine Valley / Ryan Chapel area two miles to the southwest as the social focal point of the region. Many residents of that area moved to the town of Burke, and most Burkians maintained strong ties to Ryan Chapel Methodist Church and Cemetery. Some Burke residents also attended church at Pine Valley and attended Pine Valley School for part of their school years. Pine Valley also provided the closest route to the Neches River for those who enjoyed river fishing. The Neches River was the main fishing locale for the area before the large lakes were built in the region. It should also be noted that Burke and Pine Valley maintained a close relationship with the Alabama Creek Community just across the Neches River in Trinity County. Several fords across the Neches provided access to Trinity County. Names the webmaster heard as a child (but never saw) included Rocky Ford and Delaney Crossing. Burke also had close connections to Renfro Prairie and Beulah. 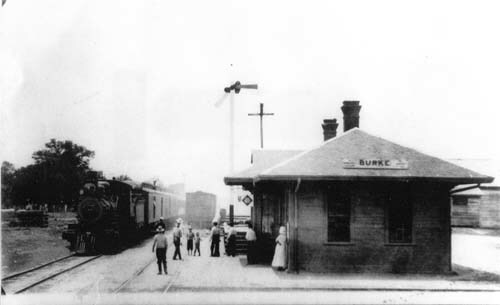 Several families moved to Burke from that area when the railroad was built, and Burke served as the primary trade location for residents there. The Burke post office also served Beulah in the early 1900s. Another community with which Burke had a close relationship was Hoshall. Hoshall was originally known as Bitterweed Flat, but after the HE&WT Railroad came through the area, a timber cutting operations was established there in 1913 by W. E. Hoshall. In 1917 Luke Wright established a sawmill and named the company town Hoshall. Several Burke residents, including the author's grandfather worked at the mill. The sawmill closed in1940.